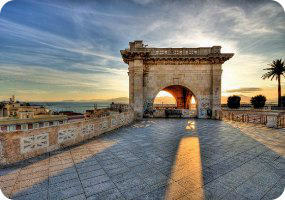 Book now the best shore excursions in Cagliari. High quality and safety at the lowest prices. If your are looking for Shore Excursion Cagliari, book now the best guided tours at lowest price with Ancora Tours. Since 2003 we offer you official guides in english, transportation and travel insurance, all included. The highest quality at the lowest rates. This shore excursion explores the capital of Sardinia, a very special geographical mix of hills, lakes and sea; with much wildlife, flora and fauna. Cagliari has it all: beautiful beaches, art treasures, delicious food and the perfect climate to for a relaxing shore excursion. Souvenir: Red coral jewellery or local foods such as wine or olive oil. Our Cagliari shore excursion begins in one of the most important streets of the city, Via Roma. From there, we drive onwards to see the surrounding city walls, finally reaching the Belvedere where we leave our coach. We’ll admire the Roman amphitheater before crossing Porta Cristina, the ancient gate into the city. Here, in the heart of Cagliari, our tour guide leads you through narrow lanes and historic buildings, until we reach the magnificent cathedral, the most important monument of the city. Nearby the cathedral is the Royal Palace, from where we’ll walk up to the Bastion of Saint Remy in the Castello part of town. Here, we’ll have some free time to take photos of the panorama. Next, our Cagliari shore excursion will meet the bus at Constitution Square to take us to our next stop, the Basilica of Bonaria. This Roman Catholic shrine has been looked after by the Mercedarian order since 1335. The Cagliari shore excursion will conclude at Monte Urpinu. From this hill, there are some great views of the harbour and of the distinct rock known as Sella del Diavolo (Devil’s Saddle). Enjoy the view of Poetto beach below, and maybe even spy some flamingos in flight on their way to nest at Molentargius lagoon nearby.